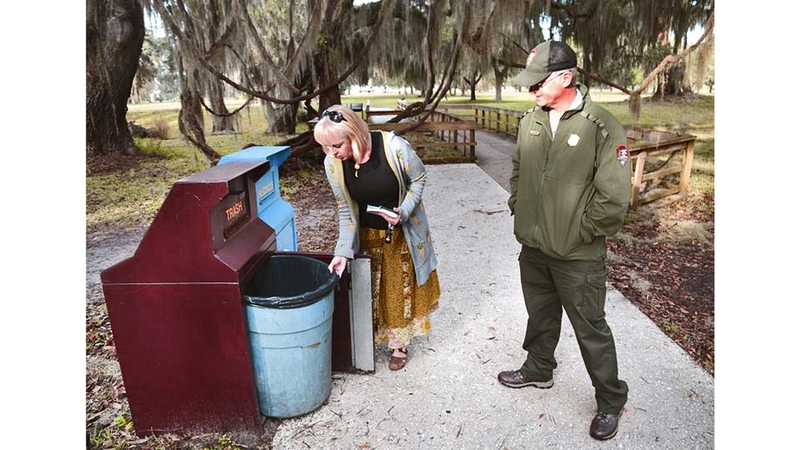 Keep Golden Isles Beautiful Executive Director Lea King-Badyna and Fort Frederica National Park Site Manager Steve Theus check out one of the trash and recycling bins at the park. KGIB is assisting with containing litter during the current government shutdown. Photo courtesy of Bobby Haven, The Brunswick News. STAMFORD, Conn., January 14, 2019 /3BL Media/ – As national parks face issues with unmanaged waste during the government shutdown, Keep America Beautiful, the largest community improvement organization in the United States, and Nestlé Waters North America, one of the leading beverage companies in North America, announced today that they are teaming up to help mobilize affiliate organizations and volunteers across the country to clean up these shared public spaces. This initiative is just the latest example of the long-term partnership between Keep America Beautiful and Nestlé Waters to address waste and recycling issues around the country. In 2017, the two organizations, along with other corporate partners, launched an integrated recycling education and awareness initiative for the 10,000 school students affected by the water crisis in Flint, Mich. That same year, in Florida, Nestlé Waters, through its Zephyrhills® Brand, also partnered with Keep America Beautiful to increase access to on-the-go recycling on beaches and at other public recreation locations along Florida's waterways.